So it's time to announce the winners (top overall game and the top game in each of the categories). The theme is: love is blind! Good luck to everyone and I'm looking forward to seeing all the games you make! You can share your progress using the Twitter hashtag #BrackeysGameJam. 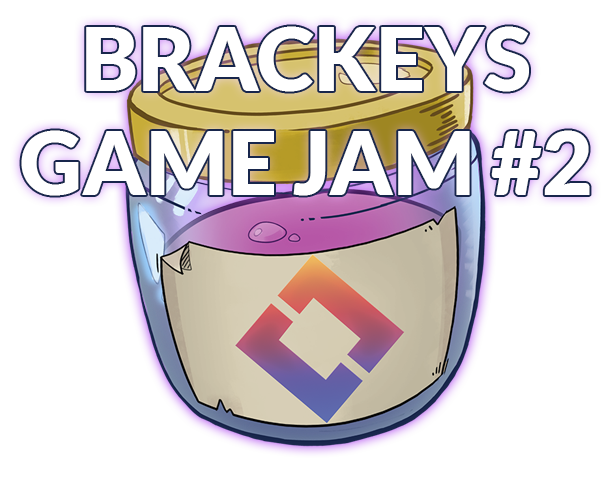 Welcome everyone to the second official Brackeys Game Jam! It was a lot of fun last time so we're definitely doing another one! (and definitely more in the future) I hope we see lots of amazing games like last time, and more importantly, that you all have fun, get creative and make some games! This jam is going to be really similar to the last one (but this time better organised). It's a week long jam where participants make games around a specific theme (announced on the start of the jam on this page and on our Discord server). The games are rated by other participants in specific categories (more on that in a bit). Huge thanks to Lizzardman for making the art for this game jam, making it at least 100% better! Join our Discord server where you will be able to share your progress on the jam in the #gamejam channel, and just chat with the community. You can also get the game jam role to show that you are participating by running the !gamejam command in the #bot channel. Anyone is allowed to participate as long as you're allowed to have an itch.io account. If you are in a team you should add your team members as contributors to your game so that they can also rate other games. The top overall game and the top game in each of the categories will get a special role on our Discord server. Brackeys will also showcase and give feedback to their favourite games in a video, so look out for that! And most importantly, you will hopefully have a working game and have fun making it! Game jams are a great time to experiment with ideas and in the end have something playable, sometimes people continue working on their jam games after it's over because they came up with a good idea and the jam game is very fun and interesting to play. Everything has to be made during the jam. You can't use code or assets you made before the jam or from other sources. Assets from the asset store aren't allowed either, except assets that don't contribute to the game and are used to make the work easier and improve your workflow. Example of allowed assets: TextMesh Pro, ProBuilder, Post Processing Stack, ShaderGraph, A.K.A. Package Manager assets. Standard assets aren't allowed. Another exception to this rule are fonts, you can use them as long as they're free and you follow their license. All game engines and frameworks are allowed. Generators where you have some sort of control over the output are allowed (like sfxr). Completely automatic generators are not. After the jam is over (when submission time closes) you are allowed to fix game breaking bugs as long as you provide a changelog. After the jam is completely over (after the winners are announced and the rating period ends) you can do whatever you want, but it would be nice to leave the jam entry page unchanged so people can play the original game in the future. Love is blind! Guide the discs through the maze to unite them in the portal to the next level. Secret agent Skinner saves lover, after going blind from gunshot. Bound Through The Connection Of Love. Spread LoveLessness in The Name Of Love! In the post-apocalyptic world, men with multiple chins scavenge the polluted fields for sustenance. A little game, which we created for the 2nd Brackeys GameJam. She asks for something ... will you do it? Be the best love guide that there ever was! Why do you love me even though I am ugly? Last Pic. The creepy way to the heart. Solve puzzles in this 2 dimensional platformer and help Mr. and Mrs. Cube save their relationship. The "Invisible" Man can turn invisible... when nobody is watching. Short tale about chasing a newborn love. Discover the true story of 'The Egg' through this parkour style platformer. A mysterious black mass has been destroying your world. Save your children from it! A submission to #BrackeysGameJam 2, explore a world revealing itself to you while finding a way to revive your soulmate. Go throgh the cave blinded by love of your crush just to cure her! Fight darkness with our love! Small point and click game where love may be just a bit dark. You never know what goes on in another head. Find your lover in the darkness! A chocolate diehard faces sweet monstrosities. Love is Blind and Demons are coming. You must protect love. Kill every single demon that comes in way. Run through the dungeon after your boyfriend who was kidnapped. The story of a friendship between a lonely boy and a rejected robot. Two lovers are forced to traverse a dilapidated dungeon together while remaining unseen by each-other. A top-down shooter made for Brackeys Jam #2 with the theme "Love is Blind"
Love is blind! Now kill all those blind love monsters! Find your way to your love through the darkness of loneliness and fear! love is blind, so i'm killing it. An endless shooter in which Hate incarnate tries to destroy love. Made for the Brackeys Game Jam #2. Play as the character named LOVE, who is cursed by a sage to be blinded. Survival of the species depends on forced mating! A challenging puzzle about filling hearts with love, Kappa. His beautiful disciple is in love with him, but he is rejecting it! A young gentleman must reach his true love. Find your loved one inside this maze! Can you get to your love before the plane leaves? The love of your life needs rescuing. Go get her! 2D Platformer in which you are love, but you can't see without hating. Brackeys Game Jam #2: A bunny and a pig in love. You have to help this guy in order to go home to see his lovely lady! Game for Brackeys game jam #2! Collect as many hearts as you can before the timer runs out! The heart shaped creature will follow your cursor. Try to avoid dangers and Find a way to complete a peaceful task. W - Jump. A,D- Move. Space- Attack. Save your mole princess in my entry for my first Game Jam in Brackeys Game Jam. Chase after the girl of your dreams while avoiding dastardly traps! Protect me !! is top down shooter and collecter game. An extremely near-sighted gentleman may need your assistance. Some loves have endless hurdles. Disorienting visuals in a small maze. Goal is to find your other half. Search and collect red hearts while avoiding or shooting purple ones. You have to try to escape from the loving city on Valentines Day. Be a Guide Dog and lead your beloved master in his trials. Use your brain to defend your heart against bad relashionships. There are balls to collect. In this game you have to save the girl from the zombie.!!!!!!! How deep into the darkness will you go to earn someone's love? Have you ever seen a cupid on steroids? A lazy cupid that doesn't want to descend to work. Let's make random love pairs, shall we? ​In Erythrozyt you play as a little red blood cell who is dreaming to conquer the love of the heart. Protect your loved one from all the dangers in the world. Guide Bella and her little blind hooman throughout the course by drawing lines. A beautiful text adventure game, set in the depths of space. Love is blind but you must help her by destroying the words! Game made for Brackeys GameJam #2. You control a heart in 5 chalanges. Mini game about life and deflecting grenades! Getting around each other, together. Calming game With music! Climb the biggest mountain! WALK arround DO ANYTHING! NO LIMITS! Grow your city and help your blind residents to make them love you. This game is all about using your love to solve your puzzle. First real game i made alone. It took me 24Hours and I'm quite proud of the results. Hope you'll enjoy playing it. VR gardening toy, tend to your own little garden. Brackey's 2nd Game Jam - Theme: "Love is Blind"
A puzzle/Platformer game where you fight boss and try to resurrect your love ! Try not to be defaeted by value of money. This game was created during Brackeys Game Jam #2 and is my first game, which I developed completely alone. Entry for Brackeys Game Jam 2! Find Your Freind In The Dark! Dodge spikes and saws, run from scary monsters, fall in love with scary monsters. Can you get out of the Friendzone? Fun, little choice based game! No trailer and screenshots 'cos everyone hates spoilers! ​Help Mr Heart to find his beloved! Save your love from the darkness! Help cupid to find the love in this party. Take a trip and see that maybe some older games aren't as good as we remember them! Cupid is blind drunk, and is having trouble flying. Make as many matches as you can before you fall to the ground. A game about finding lost love against all odds. Made specially for Brackeys game jam #2. Made during Brackeys Game Jam 2019.1. An exploration of the line between passion and obsession. Finding a soul mate can be tough! Extremely unfun and made in 6 hours running on very little sleep! Love, there is no "getting over it"
An ugly little puzzle prototype for Brackeys gamejam. Do you know why I do this? Are you dumb enough to give up everything?